I’ve just had my last supper, before the big day tomorrow. This makes me almost exactly like Jesus, when you think about it, though I’m not sure he had pasta. It’s about ten hours until I start the half marathon, and a focused blog entry of any sort just isn’t going to happen. I’m too wired. Instead, here’s some “stuff”. Pictured above is the chapbook I’m giving away at AnthoCon in November. I think everything’s arranged so that some of these go into the swag bags that full convention members will pick up, though I can’t promise all bags will have one in. 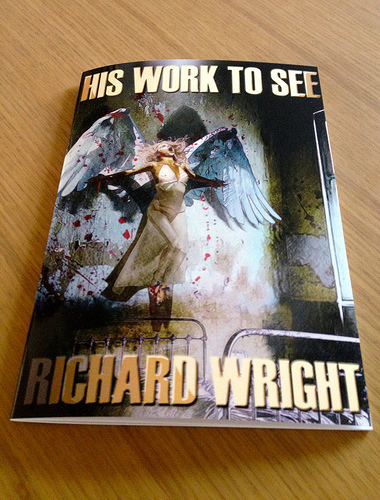 I’ll have some to hand at my author table too, so come and pick one up if you’re there. This is already available online for free as an ebook, but the physical book will only usually be available at writing events I pitch up at. The only other way to get one is to sign up for my incredibly irregular newsletter (still yet to see an inaugural edition – but you can use the box towards the top of this page to sign up). Sometimes, I’ll give one of these away, to say thanks. There’s an excellent blog post by Janet Harriet at Apex Publications about the imminent anthology Dark Faith: Invocations. My story ‘The Sandfather’ is, according to Janet, ‘impossible ‘to look at directly’ (I recommend looking at it using the shiny reverse of your shield). I haven’t seen an official note that it’s been officially released yet, so am probably imagining this Smashwords listing…. (feel free to be one of the first to read it). Update: Did a quick google before posting this entry, and while I was typing, Fangoria posted the first full review of the anthology. Talk about timing… will post separately about this book soon. On a more distressing note, that makes the timing of a book about faith horribly appropriate, my Dark Faith co-contributor Tom Piccirilli is right now battling a brain tumour, with invasive surgery due on Monday to try and remove it. Brian Keene covers this in his blog, so I won’t repeat. I will urge you to go and buy one of Pic’s books, right now. He’s an exceptional writer, so I promise you bang for your buck. He’s also an American, which means that if all goes well he’s going to be hit hard by the costs of having his life saved, and every little helps. Here are his author pages for the US and UK. There’s plenty to choose from, so please help out if you can. I’ll be travelling a lot in the next six weeks. On Monday, I’m vanishing to Singapore for a week. It will be a nice way to celebrate finishing tomorrow’s race, though the timing is just coincidence (Eva’s school is on a half term break for the week). I’m looking forward to doing some big dumb stuff, like taking Eva to Universal Studios and other big dumb attractions. After that, at the start of November, I’ll be flying out to the US to visit Boston, hang out with Danny Evarts, and do that Anthocon thing. It’s hard to concentrate on any of that at the minute, with the half in the way, but it’s going to be exciting. Which reminds me – if you haven’t yet got a copy of Thy Fearful Symmetry, I’m making it free for the final time on the Kindle on November the 5th, for one day only. Put a reminder on your phone. That day, I’ll have just landed in Boston ready to launch the paperback later that week at the Con. In the UK, it will be Bonfire Night, when everybody’s reminded that, sometimes, it’s fun to watch the world burn. Mark the date, and I’ll blow up the world for you that little bit more. Last time I did a free day it was downloaded over 3000 times, and got to number two in the free charts on Amazon. I don’t know if that’s replicable, but it will be fun to find out.